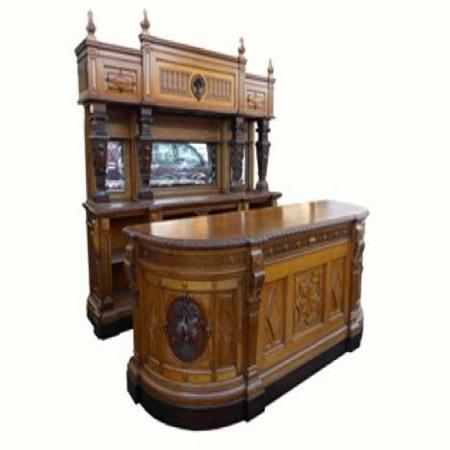 For over 25 years FGB Antiques have been manufacturing bespoke bars ideal for the home or for commercial properties. We always carry a selection in stock but can build bars to any specification. Each one is made with as much antique timber as possible. Quality engraved mirrors and stained glass are also used which gives them an authentic feel. We offer a range of bars varying from the classic front and back, to the canted corner bar, a canopy is optional on each variation of bar. Due to their authentic feel and distinct character these pieces are ideal for homes, restaurants hotels etc. As they offer ample storage space and are guaranteed to be a focal point as well as a unique talking point. 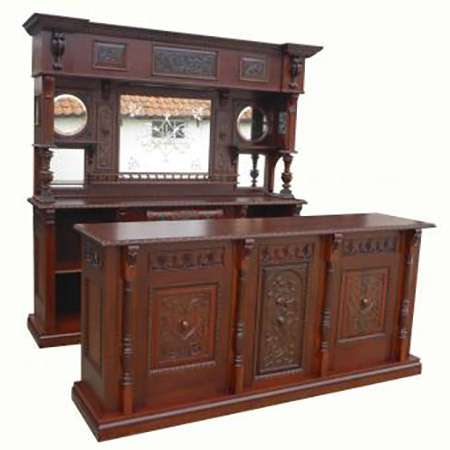 We can also arrange nation wide and worldwide shipping as we have over 50 years experience of selling fine furnishings to the private and trade customers all over the world.